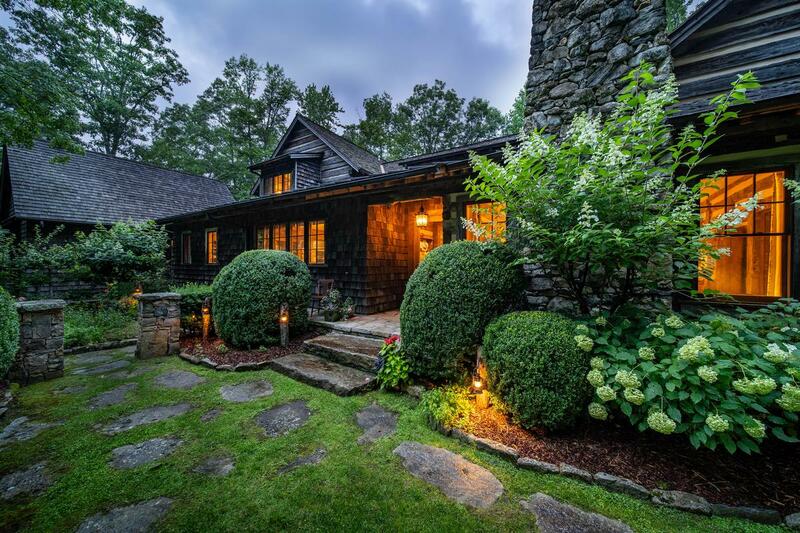 This charming lakefront home, in its serene, private setting, exudes elegant yet relaxed Southern style with heart pine floors, reclaimed timbers, and hand-hewn beams. Perfect for quick getaways or hosting family and friends, the comfortable floor plan features a roomy master bedroom with his and hers baths on the main floor, as well as two roomy bedrooms, two baths, and an office area with a wet bar. The lower level has one large bedroom and bath, a family room, wine cellar, and a full bar - perfect for entertaining! A wonderful covered living porch overlooks Lake Chattooga, and three wood-burning fireplaces add to the welcoming feel. Trails meander throughout the property for leisurely strolls down to the lake. Lake Chattooga is restocked with trout annually. Homeowners also have access to a quiet picnic area known as Mac's View, boasting breathtaking views of three states. It's the perfect spot to watch a colorful sunset against the dramatic backdrop of the Blue Ridge Mountains.